7 March 2017, Culemborg, The Netherlands – The fight for gender equality at workplaces is far from over. The recent reports by UN Women show that women in economic activities continue to suffer various forms of discrimination and unequal treatment. They also highlight that their labour force participation has stagnated. This reality has mobilised the Fair Trade movement to a renewed call to action to fight, harder this time, for the rights of women, especially those engaged in economic activities. On the occasion of the International Women’s Day (IWD) on 8 March, we want to reiterate Fair Trade’s commitment to respect and fulfil women’s rights and advance their aspirations through gender equity, fair payment, non-discrimination, good working conditions and capacity building as declared in the 10 Principles of Fair Trade. The WFTO network, including its regional office WFTO Europe, together with Oxfam Magasins du Monde embark on a global awareness raising campaign by showcasing success stories of Fair Trade contributing to gender equality at workplaces. When women succeed, communities are safer, more secure, and more prosperous. Over the last years, in the Fair Trade movement, we have seen women inspiring communities and Fair Trade organisations to stand up for women’s empowerment. As a network of almost 400 organisations across the world, today we ask Fair Trade actors to hold our poster and to share their experience via social media. Therefore, do watch, read and spread the message around to raise awareness about women’s economic challenges and support our constant commitment towards gender equality at workplace. These stories are key examples of how Fair Trade practices contribute to a world where women have the same chances as men at the workplace and in their daily life. Hence, Fair Trade is shown as a keystone in the achievement of the Sustainable Development Goals. Goal 5 aims to “Achieve gender equality and empower all women and girls”. That means, among others, the need to ensure women’s full and effective participation and equal opportunities for leadership at all levels of decision-making in political, economic and public life. WFTO and all its members are committed to advance this important agenda. We are taking steps to empower women, to fight for their rights and their equal access to economic resources, to address all forms of violence against women and to promote women as key agents for change and drivers of sustainable development. Every year, the World Fair Trade Organization and its members observe the International Women’s Day to raise awareness on gender equality, women empowerment and women’s role in achieving sustainable development. 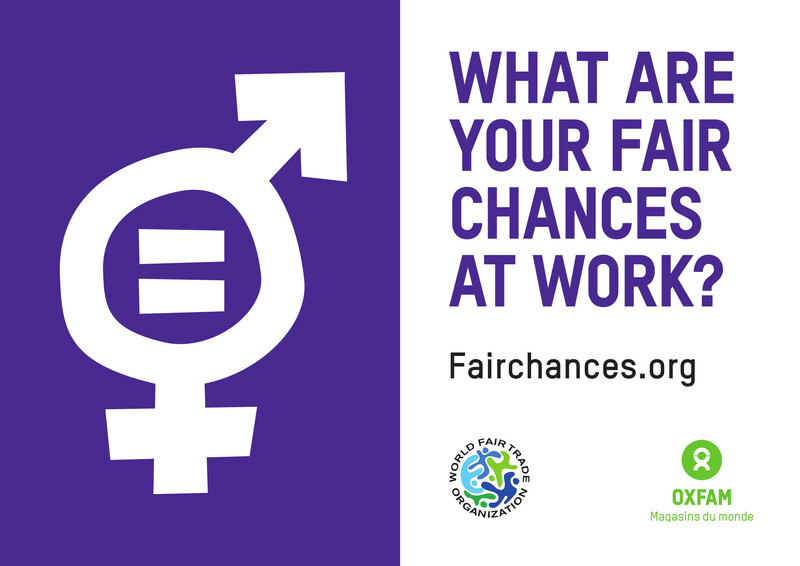 This year, for the first time, WFTO and OXFAM Magasins du Monde (Belgium) collaborate to raise awareness on the issue of gender equality at work and the role of Fair Trade in fostering decent work and equality at workplaces. To learn more of the campaign, for high resolution images, interviews and other queries, please contact Michael Sarcauga through email michael@wfto.com or give us a call +31.345536487.